Description (ebay): AMD A6-7310 (2MB Cache, 2.0GHz up to 2.4GHz Turbo Boost). AMD Radeon R4 Graphics, 4GB DDR3L-SDRAM, 500GB HDD, 5400RPM. AMD A6-7310 (2MB Cache, 2.0GHz up to 2.4GHz Turbo Boost). AMD Radeon R4 Graphics, 4GB DDR3L-SDRAM, 500GB HDD, 5400RPM. 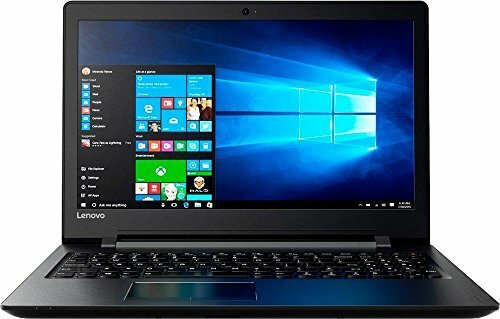 Lenovo 110-15ACL Laptop Windows 10 operating system Windows 10 brings back the Start Menu from Windows 7 and introduces new features, like the Edge Web browser that lets you markup Web pages on your screen. Learn more › 15.6" display Typical 1366 x 768 HD resolution. Energy-efficient LED backlight. AMD A6-7310 accelerated processor Quad-core processing. AMD Quad-Core A6 APU handles the AMD Radeon graphics alongside the central processor to balance the load, enabling great performance, rapid multitasking and immersive entertainment. 4GB system memory for basic multitasking Adequate high-bandwidth RAM to smoothly run multiple applications and browser tabs all at once. 500GB hard drive for serviceable file storage space Holds your growing collection of digital photos, music and videos. 5400 rpm spindle speed for standard read/write times. AMD Radeon R4 Integrated graphics chipset with shared video memory provides solid image quality for Internet use, movies, basic photo editing and casual gaming. Weighs 4.85 lbs. and measures 0.9" thin Balances portability and screen size, so you get a respectable amount of viewing space without the laptop being too cumbersome for practical portability. 3-cell lithium-ion battery. Bluetooth 4.0 interface syncs with compatible devices Wirelessly transfer photos, music and other media between the desktop and your Bluetooth-enabled cell phone or MP3 player, or connect Bluetooth wireless accessories. 1 USB 3.0 port maximizes the latest high-speed devices Also includes 1 USB 2.0 port to connect more accessories and peripherals. USB 3.0 port is backward-compatible with USB 2.0 devices (at 2.0 speeds). HDMI output expands your viewing options Connect to an HDTV or high-def monitor to set up two screens side by side or just see more of the big picture. Built-in media reader for simple photo transfer Supports SD, MultiMediaCard, SDHC and SDXC memory card formats. Wireless network connectivity High-speed wireless LAN built into the screen, so it connects to your network or hotspots on the most common Wi-Fi standards in both laptop and tablet modes. Full keyboard with 10-key numeric keypad Type comfortably, input numbers quickly and maneuver through games with ease. Touchpad with scroll and multitouch capability. Additional port Headphone/microphone combo jack.